It’s easy to forget how integral variety is to a healthy diet. Getting caught up in the flow of the workweek makes changing menus and habits into a chore. But aside from offering excitement, changing up a menu or diet plan is beneficial to the body. It provides a new set of vitamins and minerals. The best way to receive all the nutrients essential to a healthy lifestyle is to consume lots of different things. Following this advice is easier said than done. For many, packing in the healthy goodness is best accomplished through green smoothies. The controversial beverage is touted by the health community for delivering more fruits and veggies than a person would eat in a day while others speak against them, claiming that they deprive the body of the satisfaction of actually eating food. Additionally, blending food into slurry does away with the good fibre found in fruits and veggies. Even still, smoothies pack a walloping punch of fruits and veggies, a life-saver for those who have hard time consuming such things. For those who do imbibe in regular smoothies, it’s important to constantly rotate the greens used as a base. Drinking smoothies everyday attributes to something called alkaloid build-up. Raw leafy greens all contain a small amount of toxins in order to protect the plant against consumption in the wild. Repeated exposure to these toxins can negatively affect the thyroid in the long run. Symptoms of a build-up are very mild, including nausea, tingling fingertips, and fatigue. However, before you resort to desperate measures, keep in mind that alkaloid build-up is a rarity, sorting itself out after a few days without smoothies. Rather than stick to one type of leafy green (spinach and kale are infinitely popular) switch it up with every new bag. Leafy greens are categorized into different groups with each offering a unique load of nutrients. The name derives from the shape of the flowers, a cross, produced by this type of green. These contain a high level of glucosinolates which are known to reduce the risk of breast, colon and lung cancer. Kale – the second most popular green next to spinach, kale has a very mild taste and provides a huge amount of fibre, vitamins, folate, and magnesium. Arugula – having a similar nutrient make-up to kale, arugula too has high levels of vitamins A, C and K, iron, and carotenoid. Choose between this and kale based on taste preference. Cabbage – found in most markets, cabbage can lend an undercurrent of sweetness absent in other greenery. 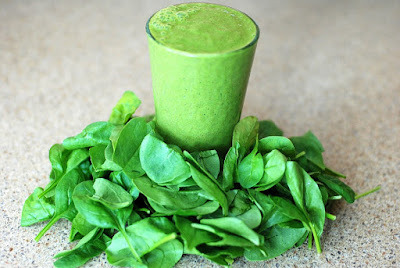 Like spinach, its flavour will blend well when mixed with fruits. Consumption will give the user a good dose of minerals including potassium, manganese, magnesium and iron. Bok Choy – a plant cultivated in China, the entirety of the plant (leafy top and white root) is meant to be used. The top leafy portion is similar to romaine lettuce on top and cabbage on the bottom. Spinach – the god of greenery, a single leaf of spinach delivers more than 20 nutrients. The leafy green offers a long list of benefits to boot, including cancer prevention, bone strengthening, vision improvement, and more. Chard – The leaves have a slightly bitter taste while the stem is similar to those of bok choy. Chard is known to improve the body’s blood sugar system. Romaine Lettuce - who would have thought that lettuce would go well in smoothies? Romaine is heart healthy, containing a good amount of vitamin C and beta-carotene to lessen the risk of a heart attack. Celery – packed with antioxidants called phytonutrients, celery has anti-inflammatory properties and increases immunity and intercellular communication. Cilantro – this little herb is chock-full of antioxidants, essential oils, vitamins, and fibre. Additionally, it has a good amount of minerals, including potassium, calcium, manganese, iron and magnesium.